The GeneralEvent will be fired on all your website pages, tracking important information as parameters. Use it on Facebook or Pinterest for Custom Audiences and Custom Conversions. The GeneralEvent is not required on Google Analytics, because their script tracks this type of data by default. Use it to create Custom Audiences, Custom Conversions, or for Facebook Analytics. The main purpose of the GeneralEvent is to help you in building highly targeted Custom Audiences or complex Custom Conversions. Facebook lets you built some incredible Custom Audiences with the help of Custom Combinations. 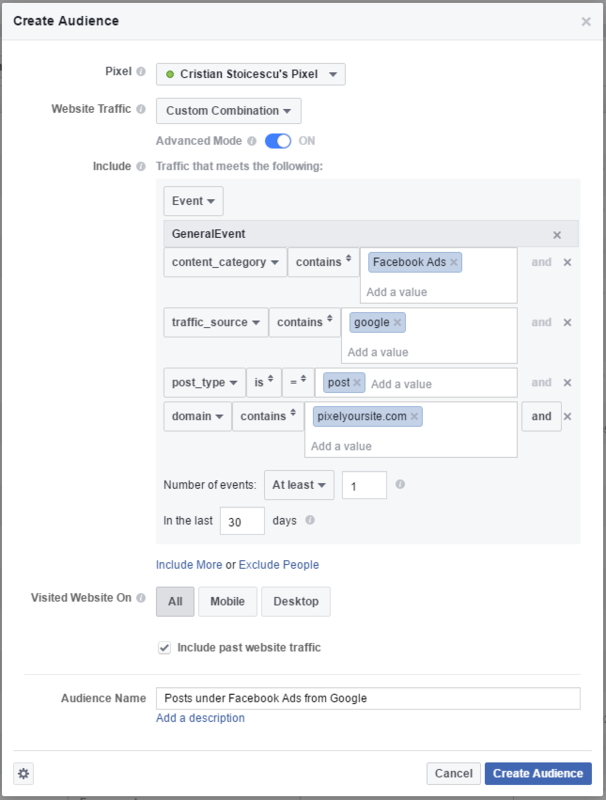 On your Facebook Ads account go to Audiences, click on Create Audience > Website Traffic and select Custom Combination. Select Event instead of URL. People that visited PixelYourSite.com (domain contains pixelyoursite.com) articles (post_type is post) under category Facebook Ads (content_category contains Facebook Ads) coming from Google (traffic_source contains google) at least once in the last 30 days. As you can see you have options to Include More or Exclude People in the same way. You can also combine events based conditions with URL Contains or URL Equals rules. Building Custom Conversions based on events (the GeneralEvent in this case) it’s a process very similar to creating Custom Audiences. This strategy is rather unusual and gives you the possibility to be incredibly creative. In the picture above you can see a Custom Conversion that’s defined as any visitor of PixelYourSite.com (domain contains pixelyoursite.com) that visits a documentation page (content_type contains docs). 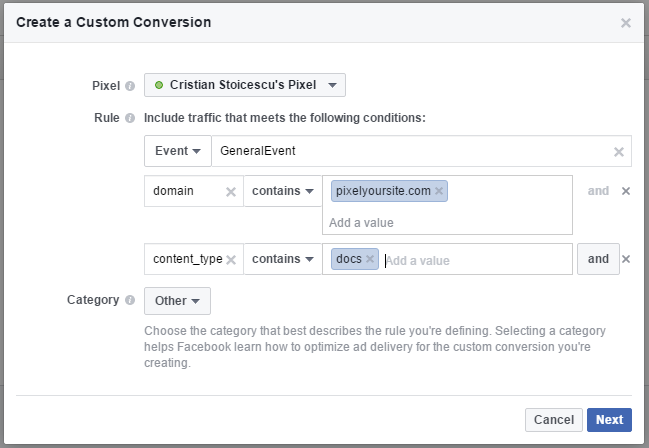 Once you have the Custom Conversion defined you can use it in two ways: to optimize your ads for it or to track ads conversion, by including it in your ads reports. This type of Custom Conversion is rather a sophisticated tool that goes beyond common optimization strategies. While most campaigns can do fine without it, you might consider incorporating it in your arsenal at some point.